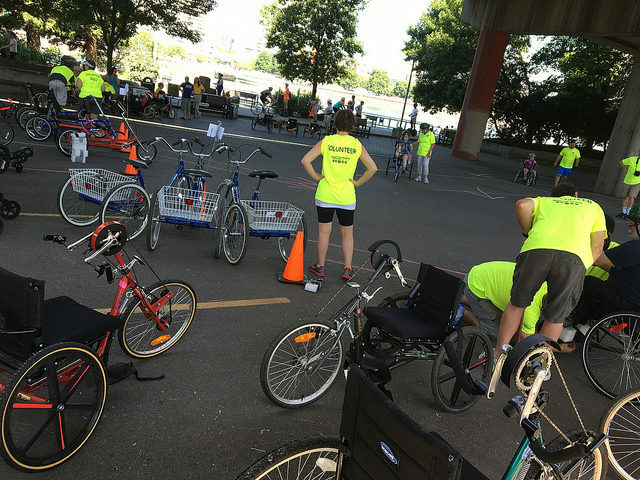 A three-wheeled recumbent at a 2016 Adaptive Bike Clinic. Source: Jonathan Maus/BikePortland. Portland and Detroit are breaking into an underexplored topic in biking — physical accessibility. The two cities have plans to create physically accessible adaptive bike rental systems as complements to their existing or upcoming bike share programs. We’ll take a look into what progress has been made so far on the accessible systems, as well as challenges and opportunities the cities have encountered along the way. 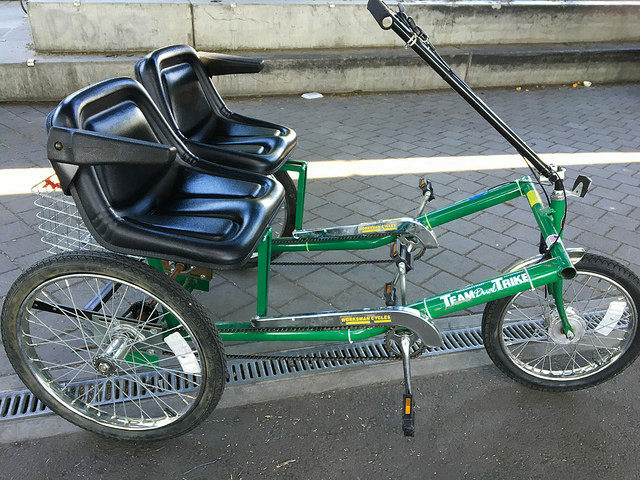 In Portland, operations staff are hoping to launch adaptive bikes in June. Planning for the $30,000 pilot project got started after the city was approached by community members seeking accessible alternatives to the BIKETOWN bike share system and city council candidates became vocal on the issue. 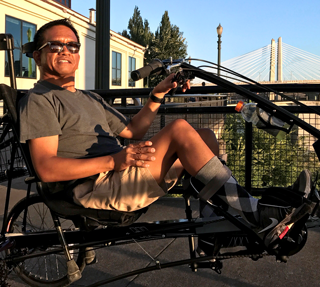 “The project is designed out of what we’ve heard to date from potential users on what they would like in renting an adaptive bike,” says Steve Hoyt-McBeth, an operations manager at the Portland Bureau of Transportation. He says the City started by connecting with disability groups in Portland, and also by conducting an online survey that received about 130 responses. Staff quickly learned that there is no single “disability community.” Instead, there are a wide variety of smaller communities, such as individuals who have visual impairments, those with spinal cord injuries, and those who have experienced a traumatic brain injury. Learning to see each group as unique was important for moving forward. 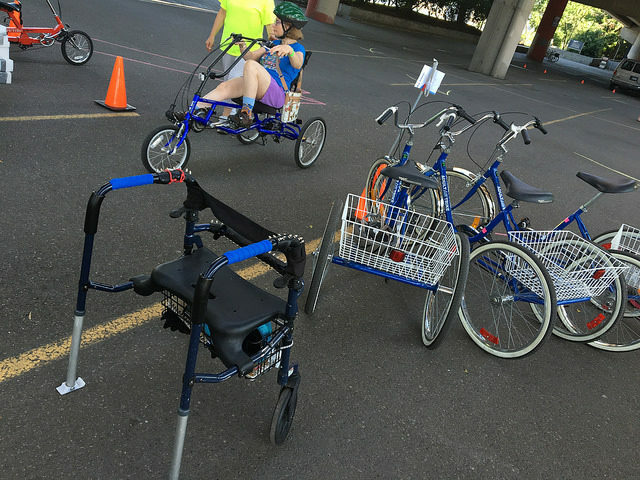 Portland has also given residents a chance to interact with potential adaptive bikes through events such as its April 2017 Adaptive Bicycle Rental Open House. There is also an advisory council for the project which includes local disability groups such as Incight, Wheel Connect, and Brain Injury Connections NW, as well as elder advocacy organization Elders in Action, and the Oregon Department of Health Services. Hoyt-McBeth says this type of partnership is crucial when planning for an adaptive bike rental system. Through its various methods of listening, Portland discovered that residents with disabilities didn’t want a replica of the existing bike share system. Instead they were looking for a service that could help them get onto the rental bikes, as well as keep their assistive devices safe while they rode. They were also looking for easy parking and transit access to the site where they could rent the bikes, as well as the ability to ride on multi-use trails, rather than city streets. The planned bike shop partners, selected from a competitive process, are Kerr Bikes and Different Spokes. Both organizations will receive grant funding for their role in the pilot project. Hoyt-McBeth says the City hopes to eventually offer three types of adaptive bikes: 1) handcycles for those who can’t propel a bike with their legs, 2) tricycles for those with balance issues, and 3) tandem bikes, so a seeing individual could ride with someone visually impaired. A working group is helping to refine the system concept. 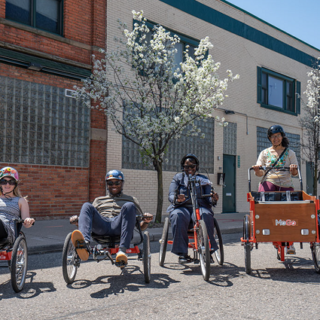 Detroit is the other location looking to provide an adaptive rental bike system. For now, the project is still in the concept phase. But dependent on funding, there will be a deeper investigation into the process later this year, after the launch of the city’s traditional bike share system. 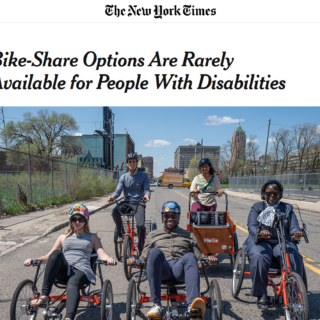 “We would hire a part-time ADA [Americans with Disabilities Act] partner to shape the program,” says Lisa Nuszkowski, executive director of Detroit Bike Share. She says such a position would be responsible for helping set priorities, such as deciding what type of adaptive equipment should be purchased. Detroit is looking closely at Portland’s example, while also trying to understand the unique local needs and concerns. “We’ve done a focus group, and we’ve done surveying to get a sense of people’s interest in this and how they would like to use the system,” says Nuszkowski. She says at the moment they are considering either a similar model to Portland — partnering with local bike shops — or placing accessible bike racks near traditional bike share stations. Detroit was first approached by a local disability partner organization, PEAC, about the possibility of adaptive rental bikes. Moving forward in concert with PEAC would be critical to the program’s success, says Nuszkowski. Nuszkowski is positive about where she sees the field of bicycling going, saying that equity and accessibility are becoming bigger priorities. “We certainly hope to be one of those early cities that other cities could replicate,” she says. The enthusiasm with which Portland and Detroit are approaching the issue of adaptive bikes doesn’t mean there aren’t still challenges to overcome. Indeed, figuring out the pricing model is a tricky endeavor. Portland hopes to provide discounted rentals based on existing structures, such as the Honored Citizen Downtown Portland Pass program, which allows seniors and those with disabilities to take unlimited transit rides. They are also considering how youth and low-income individuals could be assisted in accessing adaptive bikes. Overall, Hoyt-McBeth shares how it is critical to “spend as much effort on outreach and marketing as on the design on the program,” since ridership will be one of the metrics used in later evaluation.